Hey everyone, Trevor from Vertigo Games here. Have you ever wanted to step in the midst of a zombie apocalypse as if you were really there? After many awesome reactions from the VR community, everyone here is extremely excited to finally confirm that Arizona Sunshine is coming to PlayStation VR next month with support for the new PS VR Aim controller! 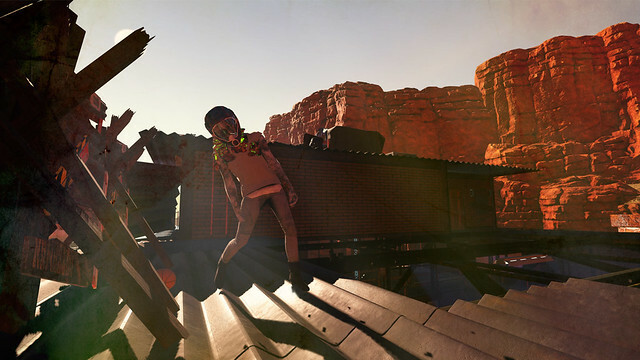 For those of you who haven’t heard of Arizona Sunshine before, it’s a VR shooter that quite literally puts you in the heat of a whole load of zombie action. You get to step into our protagonist’s shoes on a quest to find other survivors across the blistering heat of the post-apocalyptic Arizona desert, all the while battling zombies with whatever gear, ammo, and consumables you loot from your undead enemies or find on your way. You can freely explore your surroundings using either teleportation or locomotion movement, whichever suits your VR tastes best — there’s no spot-based gameplay to be found here. 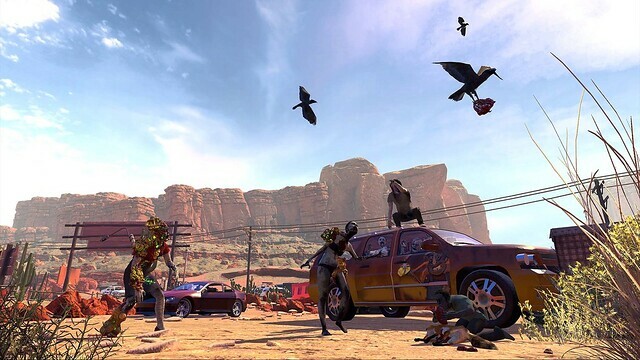 We’ve put a lot of work and love into Arizona Sunshine, building and optimizing it for VR from the ground up in order to deliver the game as we had envisioned it — a VR game worthy of being one of the first full-size games in virtual reality. Arizona Sunshine has a campaign that spans eight diverse levels set in treacherous canyons and deep, dark mines. Take on the zombies solo or join forces with a friend in co-op campaign. And that’s not all! There’s also an infinite game mode that pits you against endless waves of zombies with up to three other players. Nothing is better than having your friends at your back in the apocalypse (Well, except mocking them with gestures within your safe VR environment, of course), but we should probably warn you that more warm brains also means more hungry undead! Ever since we started developing for VR, we have prototyped a lot of mechanics — and realistic weapon handling is by far our favorite. On PlayStation VR, you can take your first steps into the zombie apocalypse with the use of regular DualShock 4 controllers, but we’re also supporting the PlayStation Move motion controllers and (even more exciting) the newly released PS VR Aim Controller! Handling your weapons with real-life movements truly is a whole different level of immersion. As for the Aim controller, since the game was initially created with dual-wielding guns in mind, we’ve thoroughly tested ways to get the support for it right. And while using the Aim controller limits you to using a single weapon at a time, it makes up for that by increasing accuracy and control, upping your chances for critical, dismembering hits. That’s right, the fan-favorite zombie mutilation mechanic also made it onto PlayStation VR! We hope you like Arizona Sunshine as much as we do when it hits PlayStation VR next month. Best of luck to you and your friends and see you at the other side of the apocalypse! I’ve been eyeing this on Steam since it’s release and am so stoked to hear you guys are using the AIM Controller! I can’t wait! Thank you and I hope to see more great VR titles migrate to PSVR! Super excited! Just to prove how excited I am let me throw in a few more !!! WHAT co-op campaign!!!!! I’m in. Awesome to see your game coming to PSVR and AIM controller, thanks a lot, DAY 1! Thumbs way up. Glad to see Aim getting support and that it won’t be a one hit wonder. Awesome! Hadn’t heard about this one but it’s on my radar now. Thanks! Will we be able to use PS Move Sharp Shooter, or only this new Aim Controller? I’m not that knowledgable about the Sharp Shooter, but it seems like you can insert your Move and then you control it with the gun. If that is the case then it should be supported out of the box. This looks pretty rad, definitely on my radar now. So here comes the burning question… Price? The price will be $39.99 in the US. Awesome :) already have farpoint bundle with the aim controller pre-ordered! Looks like his game is best on the ore-order list! Great to be a psvr owner! This announcement is for digital only, but you’ll never know what the future might bring. I for one would love a physical copy! So is there a way to wield an Aim and Move controller for dual wield? Ha interesting point, haven’t actually tried this out yet. I feel most comfortable holding the aim controller with two hands though, but definitely worth checking out. I just had to stop in cuz I live in Arizona haha and you don’t see many media things about here. Also fun fact our military has a real zombie contingency plan. I’m really looking forward to finally being able to play this, thank y’all so much for bringing this game over to us so that we can enjoy it too. I wish I knew how long the aim lasts on a full charge. Great news! Will there be online co-op as well like the PC version? Oh man… disregard my last comment. I’m excited for online co-op! Yep! Both with friends and matchmaking. I saw this today on Reddit first and was so completely ecstatic! I’ve BEEN waiting for this announcement (even just the regular release) but the fact it’s getting AIM support is just incredible. Day 1 for sure. I’m curious though….if you’re using the Moves for the dual weild like the Vive version, are you limited to teleportation or have you guys mapped the face buttons for locomotion? All locomotion methods are supported for all control schemes. One might be more comfortable than others for you, so you should try them all out. They all have their pro’s and con’s. I love dual wielding with both Moves, but I end up using one hand for accurate aiming most of the times. For that the aim controller is perfect. Awesome, this is the only game that hasn’t released on PSVR that i’m jealous of. How did you like the AIM? It’s awesome! It’s probably one of the better peripherals for any device that I’ve tried. The main advantage for me is that my accuracy just skyrockets. The buttons are placed really well ( and enough of them ) so we didn’t have to cut anything to get it to work with Arizona. this is awesome news! finally some super solid vr games coming to psvr! ive been looking at this and The Unspoken by insomniac and Robo Recall from epic, hoping they would come to psvr so this is exciting to finally get one of the three! Definitely day one digital as Aim is coming midnight launch in three days. Thanks much for bringing this to PSVR. These statements explain exactly the types of games the VR community needs! I am excited for this title and also glad to hear you are supporting the PS VR Aim controller. Stoked. I am pumped to play through this with a friend and using my new aim controller! Is there a small chance for this fantastic title of getting coop to work over crossplattform, like on the PC? It would be so nice to play with PC gamers instead and much more easy to find a coop partner because of a wider range. Arizona Sunshine is such a great game! Wondering why my comment was deleted. I asked a legit question – if the floating hands verses hands with arms connected is a dev choice preference or if it helps the game somehow. I prefer to see my arms in VR and I noticed this game has floating hands. It looks awesome nonetheless, but wondering how it will pan out using the aim controller. I guess you keep only comments that say how awesome you are. June what? I want it.